Building on the technological innovation of the original Voice product, the enhanced Voice+ unit measures only 1.7"x1.7"x.4" and includes several exciting new features, but is still as easy and accurate as the original GolfBuddy Voice. 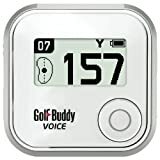 The new GolfBuddy Voice+ comes equipped with an enhanced set of features including a comfortable silicone wristband to provide the user with greater comfort and usability. Additionally, the new Voice+ features an 11 hour re-chargeable lithium battery, to offer the golfer two full rounds of use on a single charge. Integrated enhancements to the Voice+ software now enables the unit to display front, center and back distances directly on the main screen. This improvement will allow the user to quickly reference the Voice+ visually or through its audio functionality. MOST ADVANCED TALKING HANDHELD GPS. GolfBuddy's latest handheld comes jampacked with new features like voice audio and bluetooth connectivity. It's slim, lightweight design make it the ultimate rangefinder that offers the finest golf GPS experience. Pre-loaded with an industry leading 38,000+ global courses, the GolfBuddy VTX continues to innovate in the handheld category.